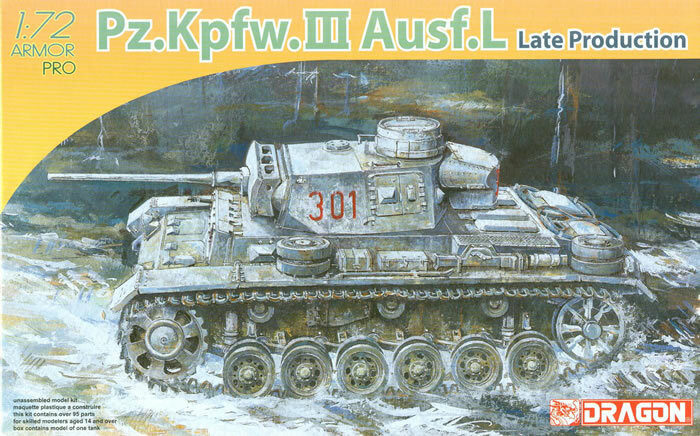 After a hiatus of several years DML has now returned to 1/72 scale Panzer III kits with this new release of an Ausf. L. Using some of the tooling and parts from the nicely done StuG III kits from 2007, it captures the right look of the L variant with the long 5 cm L/60 gun. As noted, only sprue D (wheels) and E (the tracks) are retained from the StuG kit. Three new sprues cover the upper hull and turret of the L model and its details. The hull comes with the places marked in raised lines for the side hatches, but from what information I have late model Ls did not have side hatches. A few careful passes with a knife tip or mini-chisel should remove them. The vision ports have been removed from the turret. The kit offers four finishing options: Pz.Rgt. 25, 7th Panzer Division, South Russia 1943 (whitewash, red 301); Pz.Rgt. 4, 13th Panzer Division, South Russia 1942 (sand with brown, white 7-11); Pz.Rgt. 33, 9th Panzer Division, South Russia 1942 (sand with green blotches, red 421); and SS Wiking Division, Russia 1942 (sand, white 115). A targeted sheet of Cartograf decals is provided. Overall this is a nice (and simple!) kit of a late model Panzer III and should prove popular.